The We the People team is currently fundraising for their trip to nationals in D.C. The WePo team takes a picture with their state awards in the Minnesota Supreme Courtroom. Lillies, and malts, and steel cutouts, oh my! The Cannon Falls We the People team is back and better than ever after a year long hiatus from the activity. 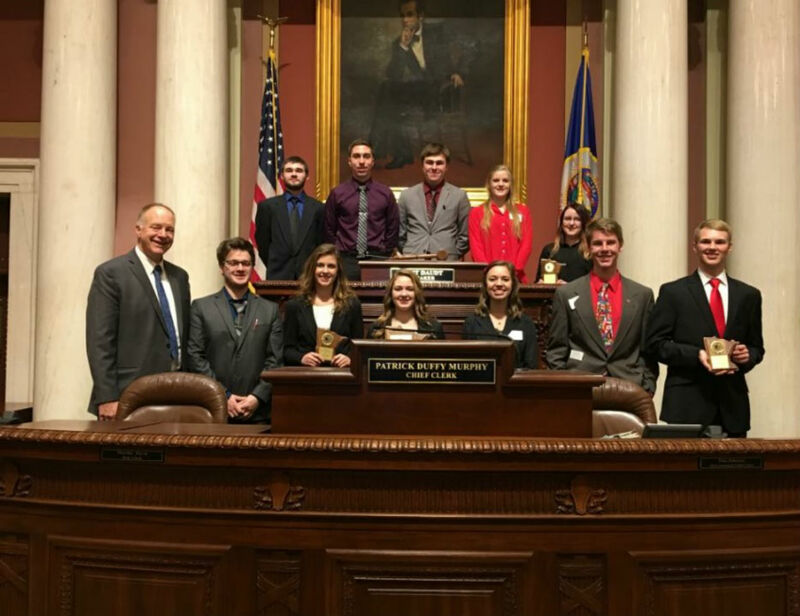 Despite taking last year off, Heather Loeschke has led her WePo students to victory once again at the state level and now the team of 11 is off to the national competition in Washington D.C. In order to get there though, the team has to first raise the $24,000 necessary to actually go on the trip. Though the students feel like their fundraising is falling short, they are about halfway there and ready to do whatever it takes to rack up the remaining $12,000. One of their most successful sales fundraisers so far has been making and selling steel cutouts. The guys on the team have taken the lead on this project as they are familiar with the plasma torch used to cut the steel cutouts. Garett Klavon said, “You can pretty much make anything you want and it only takes about 45 minutes.” So far the group has made dragonflies, team names, sports logos, and more. “Right now we have 15-20 orders that we need to do, and the orders have been pretty consistent.” That’s not all the team is doing to raise money though, for the entire week of March 12, the team was taking shifts during all the lunch hours to sell malts. In the past, the team has gotten an actual malt machine from the creamery in Hastings, but after inquiring about using it again, they learned that the creamery no longer lends their machine out. This was a minor setback, but they ended up ordering malt cups and they sold just as well as the ones out of the malt machine. The team will continue selling malts into the week of March 20 due to an excess of leftover malts. On top of these two fundraisers, the students sold Easter lillies and they continue to receive donations through their letter campaign. Stop by the concessions stand during lunch and for just $2 support the WePo team on their way to nationals, and have a delicious malt. Wish the team good luck before they leave on April 27, because that’s when the students will hop on a plane to D.C. to compete in nationals and do some sightseeing to hopefully learn a bit more about the government.